The self-managed web pages are an ideal tool for any company, regardless of size, You can have a constantly updated website, news, News, Articles of interest, Recent work, etc. It consists of two types of pages: Fixed pages and news. – Fixed Pages: As will update the website, pages still do not move your site. Usually remain in the top menu of the page (Although you can make the left or below, This is the most common location). 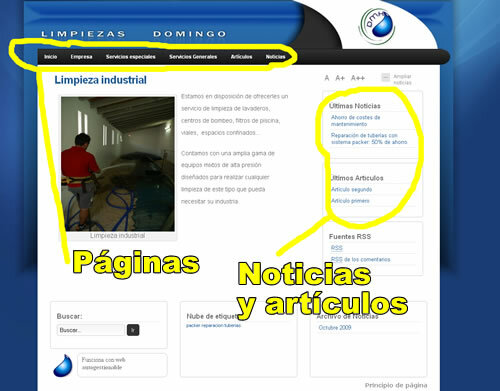 These pages are typically used to report content that does not change: Company Details, main families of products or services, etc. – News: The news often get in the right part of the site. The latest news usually appear on the site's home page. The most important with respect to the fixed pages difference is that appear as new news, ancient disappear sections of "latest news" and are being left in the archives. Web self is called because they do not need any programmer or expert to maintain and adding pages and news. Anyone who can write a letter with computer, You can maintain a self-managed website. See the advantages of a self-managed web.